There are many documents for the White Bluff POA, each with its own level of authority. 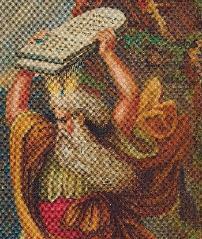 which might be considered to be like the White Bluff Property Owners' Association Ten Commandments. These DECLARATIONS are where it may seem as if... developers got to play god. a method to amend the Declaration during a development period. for White Bluff Subdivisions 41 and 40. "The right to Amend the Restrictions and Covenants is expressly retained by Developer." That sentence gives the Developer the authority to amend those WB-41 Covenants. The right page above, for WB-40, (below the pink line) says NOTHING about amending. 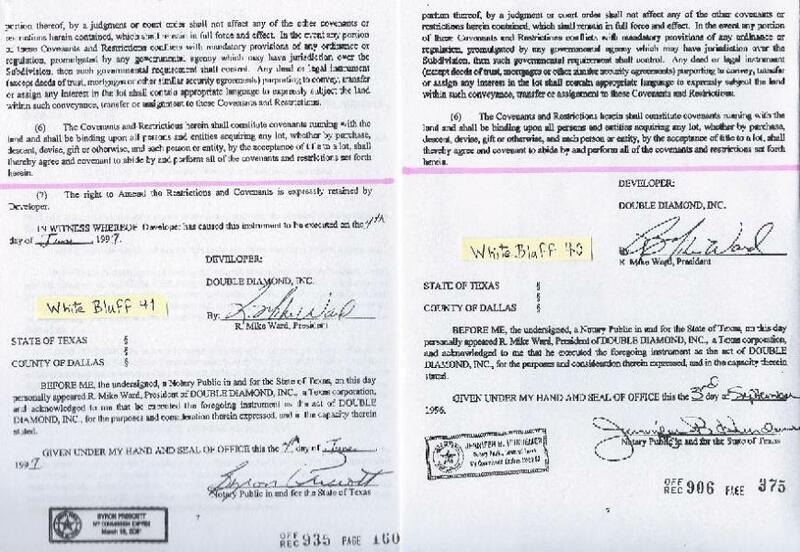 Does this mean the Covenants for WB-40 may NOT be amended? 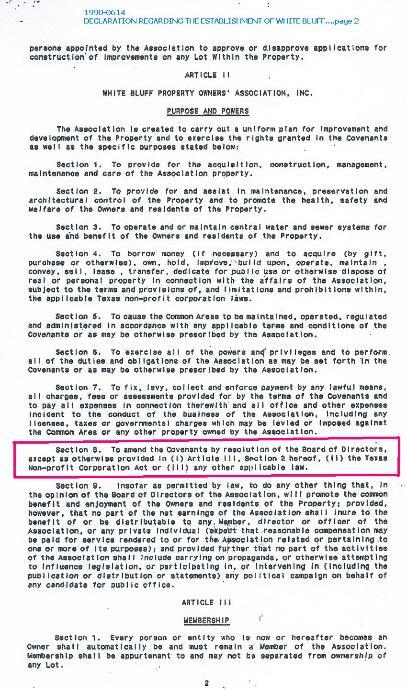 Covenant, AND also, in the DECLARATION REGARDING THE ESTABLISHMENT OF WHITE BLUFF PROPERTY OWNERS' ASSOCIATION, INC.
Did you notice the paradox in the Document above, where the Board gave that right? AFTER they DELETED their right to amend, they amend anyway ! "The right to Amend the Restrictions and Covenants is expressly retained by Developer. in his DECLARATION, AFTER it was recorded by the County ? BLUFF... grants no one, any authority, to amend anything. Where is his AUTHORITY to amend that DECLARATION?